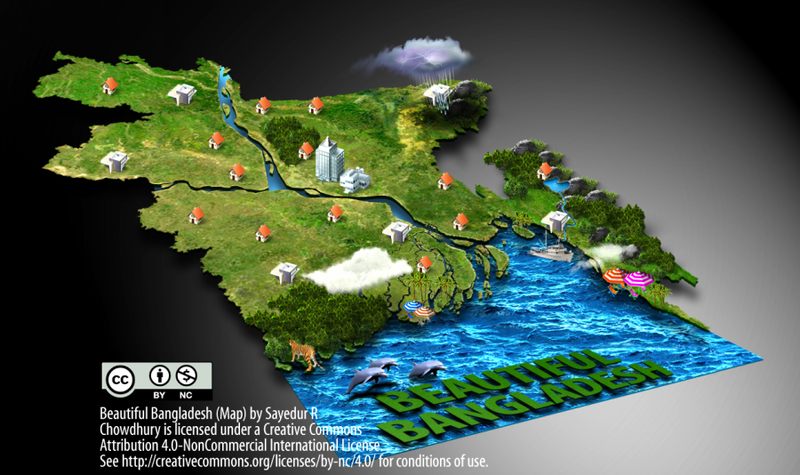 Beautiful Bangladesh (Map) by Sayedur R Chowdhury is licensed under a Creative Commons Attribution 4.0-NonCommercial International License. See http://creativecommons.org/licenses/by-nc/4.0/ for conditions of use. Thanks ফরিদুল আলম সুমন, since this is just an illustrative map often called infographic, I did not put a legend on this map. It shows all major towns (capital, division HQs, greater district HQs, hills, forests, beaches etc). Sir, is there any way to get the high resolution image of this map? Thank you for your interest, but unfortunately this is what I have now, the hi-res version was lost when my computer crashed last time.